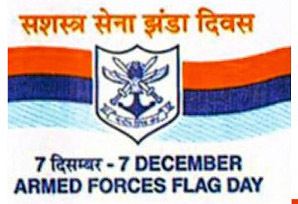 Armed forces Flag Day celebrated every year on 7th December since 1949, reminds the sacrifices made by our armed forces and also gives us as opportunity to express our solidarity with the armed forces. In his message, President Pranab Mukherjee has asked citizens to voluntarily contribute towards the noble cause of rehabilitation of war widows, disabled defence personnel, ex-servicemen and their families. The President said they have been serving the nation with great distinction both during war and peace.